Obama gave Poroshenko new security guarantees. Poroshenko asked for them. Especially ones related to “defense.” He “received a positive answer,” he said. Both countries partner against democratic freedoms. Ukraine’s fascist government excludes them. It prohibits democracy. It’s verboten. Illegitimate hardline rule prevails. Obama supports, encourages and demands anti-democratic governance. He presides over America’s police state apparatus. He wants Ukraine governed the same way. “Nothing is ever as it seems to be.” Reality is polar opposite proliferated myths. Monied interests run things. America bears full responsibility for global wars, instability, insecurity and human misery. Its Western partners, Israel and other rogue allies share it. It’s way too late for scattered reforms. Major change is needed. Ordinary people have power when they use it. Nonviolent disruptive power works best. Electoral politics doesn’t work. Rare exceptions prove the rule. The late Chicago community organizer Saul Alinsky (1909 – 1972) once said the best way to beat organized money is with organized people. It’s always bottom up. It’s never top down. It’s verboten in Ukraine and America. Their political systems are too corrupted to fix. They show how power corrupts and absolute power does so absolutely. It showed “sacrifice, dedication and the unbreakable will to live free,” he claimed. He claimed they did it with “sticks and shields.” He ignored Western trained neo-Nazi Ukrainian snipers murdering dozens of Maidan police and ordinary people. Over 100 died. They were killed in cold blood. Washington’s dirty hands orchestrated what happened. “We revere them as true national heroes,” he said. They’re not martyrs. They’re victims of fascist viciousness. Poroshenko didn’t explain. Nor his US or other Western partners. MSM scoundrels regurgitate official Big Lies. 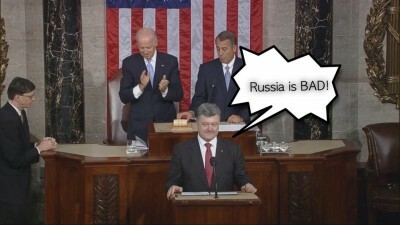 Poroshenko’s address repeated one after another. Truth was systematically buried. Congress wholeheartedly approves. So does Obama and top administration officials. You can’t make this stuff up. Truth is polar opposite Poroshenko’s Big Lies. He gets marching orders from Washington. He salutes and obeys. Ukraine is America’s newest colony. Poroshenko is a convenient stooge leader. He serves at Washington’s discretion. He’ll continue doing so as long as he remembers who’s boss. Young Ukrainian army recruits “are the only thing that now stands between the reality of peaceful coexistence and the nightmare of a full relapse into the previous century and a new cold war,” he claimed. It bears repeating. You can’t make this stuff up. Poroshenko’s Big Lies didn’t rise to the level of bad fiction. He asked Congress for more military support. He met with John Kerry. He got pledges to supply it. He ludicrously claimed Ukraine “always had a special bond” with America. Today it’s Washington’s “natural and consequential” regional partner. It’s not “circumstantial,” he said. We’re “in the same boat,” he added. At a time of “existential crisis, Ukraine’s choice was the same as America’s: freedom, democracy, and the rule of law,” he claimed. It bears repeating what other articles stressed. Ukraine is the epicenter of European fascist reemergence. Its lawlessness, belligerent, anti-democratic and fascist. Its no-holds-barred barbarity matches some of the world’s worst. Its egregious human rights record reveals its dark side. Police state ruthlessness is official policy. So is state terror. War on fundamental freedoms persist. Ukrainian democracy is pure fantasy. Fascist thugs run things. They represent mob rule. Unchecked power defines them. They’re ruthless. They tolerate no opposition. It’s systematically eliminated. Rogue states operate this way. Putschist ones have no legitimacy. Ukraine is one of the worst. Washington provides wholehearted support. It encourages Kiev’s high crimes. It funds them. It wants democracy advocates entirely eliminated. Vicious state terror tactics target them ruthlessly. Western propaganda suppresses reality. Illegitimate putschist power is called democracy. Poroshenko wants more military aid. Southeastern Ukrainian self-defense forces battered Kiev’s troops. They’re in disarray. They’re regrouping. They’re preparing for more conflict. Ukraine needs “a strong army,” Poroshenko claimed. To wage premeditated naked aggression. To brutalize Ukrainian citizens. To commit more mass murder. To tolerate no opposition. To crush democracy advocates once and for all. To institutionalize fascist rule. To ally with Washington and rogue EU partners against Russia. To risk East/West confrontation in the process. In November 2002, a NATO/Ukraine Action Plan was instituted. In February 2005, Ukraine became the first post-Soviet Commonwealth of Independent States (CIS) nation to join NATO’s Partnership for Peace initiative. In April 2005, it joined NATO’s Intensified Dialogue program. In March 2008, it sent an official Membership Action Plan (MAP) application letter to Brussels. It’s the first step to joining NATO. Washington supports it later. Not now. So do other key NATO member states. Russia categorically opposes incorporating Ukraine into the Alliance. Both nations share a nearly 1,500 mile land and sea border. Moscow won’t tolerate US-controlled NATO bases on its borders. Or encroaching multiple nuclear armed long-range missiles targeting its heartland. It calls Ukrainian NATO membership “a direct (national security) threat.” It does so for good reason. He saw no reason for Ukraine to join NATO. Membership might “emerge at some point,” he explained. It prohibited Ukrainian membership in any military bloc. It permitted cooperation alone with ones like NATO. That was then. This is now. Poroshenko and Washington intend incorporating Ukraine into NATO. Expect it at America’s discretion. Expect strong Russian opposition. It remains to be seen precisely how Moscow will react. Ukraine is its red line. Putin won’t let it be crossed. He won’t compromise Russia’s security. His strategy will be revealed in the fullness of time. It bears repeating what other articles stressed. America’s quest for unchallenged global dominance threatens humanity. Potential East/West confrontation looms. World peace hangs by a thread.